My parents were postal workers who took pride in simple things. Their home. Their garden. The sunny optimism they passed on to their children. I thought I knew my parents so well. I was wrong. I set out to write a book exploring America’s hidden conversation about race but changed course when I started listening intently to the hidden conversations in my own family. I was shocked to learn that my father was shot in the leg by white police officers in Birmingham, Alabama shortly after returning from his military service in World War II. While the wound was superficial, the experience was not and the story remained submerged for decades. He didn’t even tell my mother. But my Mother also had a secret. She never spoke about the years her mother worked as an itinerant Aunt Jemima, traveling to small towns conducting pancake mix demonstrations, dressed in a hoop skirt and apron with a bandanna on her head. My parents kept these stories to themselves because they wanted their children to soar. They didn’t want to weigh down our pockets with tales of woe. Instead, they armed us with ambition instead of anxiety. I always knew I was shaped by my parents’ expectations and the advice they doled out. What I did not realize until recently is that I was also shaped by the weight of their silence. I now understand that I was molded in myriad ways by those things they never talked about but that nonetheless dictated how they lived their lives. Silence, I learned, had its rewards…..and its costs. 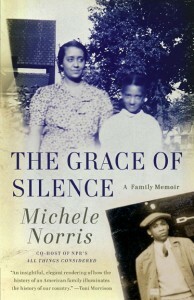 I hope The Grace of Silence encourages people to think about their own complex family legacies and to consider a core question: How well do we really know the people who raised us?